Silly title. Silly story. A moment of tragic(?) nonsense that shows that sometimes it just doesn’t matter how well you take care of your equipment things can, and do, go wrong. Don’t worry. It’s not about Bear. He’s in ship shape shape. No, it’s about a sad state of affairs relating to me and my custom-made dressage boots. Okay, I bought them almost 10 years ago and for about seven of those years (up until fairly recently, in fact) they sat in a boot bag at the back of a dusty closet. Why? Because a sprained ankle all those years ago made it impossible for me to put the darn things on and once out of the habit of wearing them I just couldn’t be bothered. So, I fished them out of the closet and took them to the barn. I located my boot hooks (because the only way to get these darlings on is to insert boot hooks to boot loops on the inside of said boots … and pull!!!) and went to work. And, wouldn’t you know it? The darn things were so stiff from lack of use I couldn’t get my foot anywhere near the bottom of the boot. Not only that, they were really, really tight. Hmmm … zippers. A novel thought. I’d noticed that many of my fellow riders, including my coach, had done just that and that they’d all gone to the same zipper putter inner at a shoe repair shop not far from my home. Eureka! That’s what I would do. So, I packed my boots back into their bag and took them to the shoe repair guy. I explained to him what I needed. “Yes, I guess so,” I responded, unsure but willing to lean on his expertise. So, I left the boots and hoped for the best. A week later I picked them up and took them home to shine and polish according to the shoe repair guy’s explicit instructions, focusing especially on the ankle area to soften the leather. Excited about trying them out, I took them to the barn the next day and, after dousing the insides liberally with baby powder I inserted hooks into loops and attempted to pull the right one onto my leg. It was a struggle at first, but eventually I got it, and the left one, on. I rode. Awkward doesn’t describe it. I hadn’t ridden in them in years. Still, I thought, the more I wear them the easier it would get. Fast forward through the month of June (away) and most of July. I rode in my half chaps mostly, due to the heat, but on a cooler summer’s day, Tuesday of last week, in fact, I struggled into the boots for a lesson. Things went swimmingly. “Do you see a difference when I ride in these boots?” I asked Herr Coach. So, I reasoned, I must wear my boots. Removing the boots was a struggle. Bootjacks are an absolute necessity when extricating oneself from the vice grip of a close-fitted tall boot, and I had to wriggle myself free of both boots with a great deal of care. Hmmm … the only way to get used to the new leg position was to keep wearing the boots. So, on Thursday last week four of us went out on a lovely hack in the fields. I wore my dressage boots to continue breaking them in. 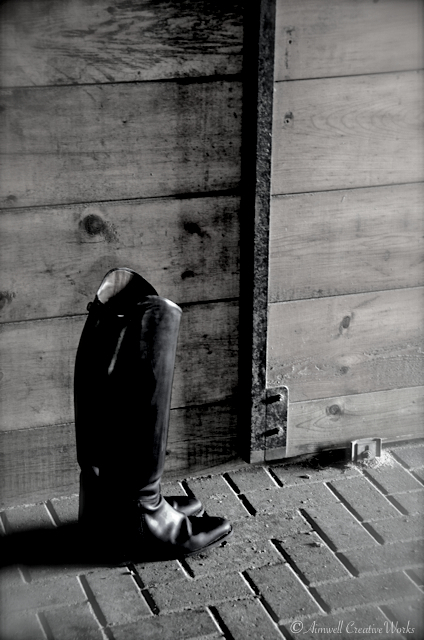 When we returned to the barn and after I’d untacked Bear and made him comfortable, I went to my locker to fetch my bootjack so I could remove my boots. Once again I had liberally sprayed baby powder into my boots before putting them on, so I anticipated they’d slide off with ease. Right boot ~ with the heel of my boot wedged in the curve of the bootjack I started pulling my leg free. My foot began its slow migration up the boot … and then it got stuck. “You stuck?” A concerned fellow rider enquired as I clung to the doorway between efforts, a contorted look on my face. “Nothing I can’t handle,” I said with more confidence than I felt. Then I tried another tac, wiggling my foot up and back and up and back. Finally, it came free. Setting my left heel in the bootjack and resting my right foot (now sporting a paddock boot) on the base of the jack for leverage, I grabbed once again onto the doorway and began the ordeal. Once again my foot slipped from the bottom of the boot and got wedged at the ankle. Hmmm … that hurt. Try again. Okay … breathe and heave. No movement. A light bulb moment, to be sure, but useless to me at the time as the only way to get the boot off was to continue what I was doing. I rested for a moment. Regrouped. Surely just one or two more tugs of my foot would extricate it. Like the crack of a whip I felt a sting across my lower back. “Uh … oh! That’s not good.” I exclaimed aloud as I grabbed the back of my waist and winced. “Now I need help,” I said to the concerned rider as she once again walked by. 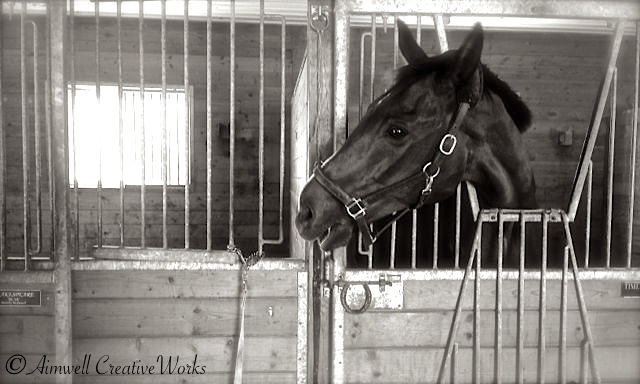 Seeing my distress she escorted me as I hobbled across the aisle and into the tack room. I lowered myself gently into the well-worn blue leather two-seater couch, and breathed. Yes, it took two people to pull the b(**&y thing off. After the ordeal I attempted to stand up … straight. Impossible. 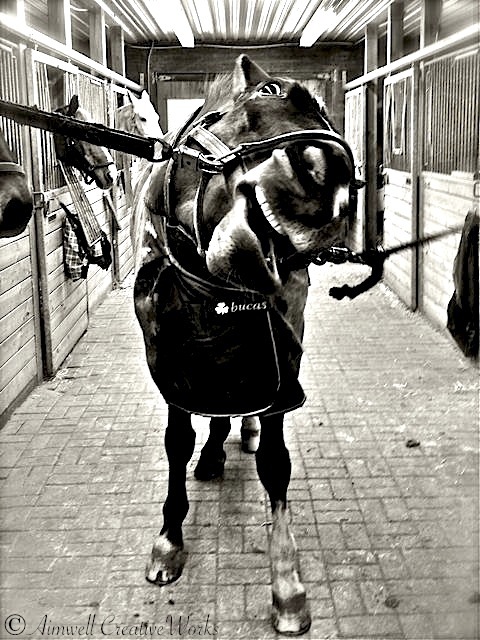 So, after taking care of my equipment (including cleaning those evil dressage boots) and seeing to Bear’s needs, I went directly to the chiropractor for some attention and then home for an Epsom salts bath. The next day I felt a bit wobbly, but got on Bear anyway just to see if a walkabout would help massage out the kinks. Not a chance. It was actually a pretty foolish thing to do. If my darling boy had spooked I would have been toast. For three days I could barely walk. I spent the weekend sitting on a heating pad and taking anti-inflammatories. By Sunday evening I was in so much discomfort I finally booked an appointment with my massage therapist who, fortunately, had some time available on Monday. After spending quality ground time with Bear, albeit hunched over like the fellow of Notre Dame legend, I went for my massage. Afterward I felt freer in the hips, but still wobbly, and the ache in the depths of my lower back was still keen. “No riding! !” the massage therapist warned. “No problem!” I answered, resigned and sad. So, my coaching scheduled for Tuesday was turned into a training session for Bear with Herr Coach. I watched from a chair in the corner of the arena with admiration and envy. 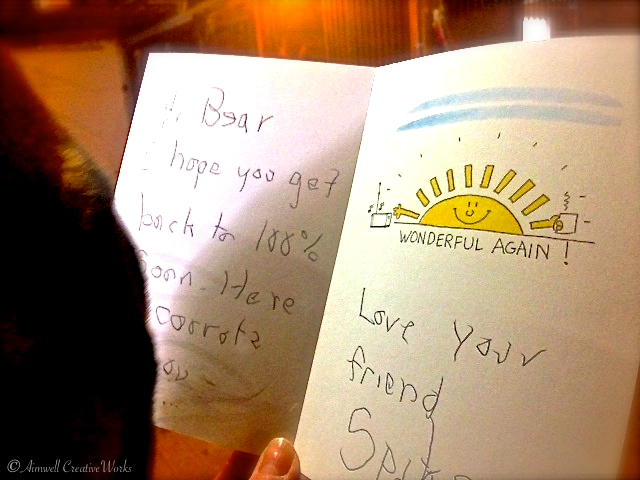 Wednesday rolled around and Herr Coach rode Bear again. I had my camera with me and took a few photos, including this one. I marvelled at how much my boy had changed and developed since January. His uphill movement giving him a bearing of lightness I’d been longing to see for years. And he looked so beautiful. Herr Coach thought that a good idea. There would no point in riding with sore hips and undermining what had been achieved in the two training sessions. Bear would simply get confused. I went to the chiropractor again. He worked his magic and I felt a little bit better again. “Of course not,” I sighed, disappointed but resolved to doing what must be done to heal. Still, it was only a short, dark period of self-indulgence, and then I let it go. This afternoon I went to the barn and spent a few hours with Bear, reviewing exercises from the FEEL program and playing with him in the arena. It was a lovely time and I soon felt much better. I even began to look at this unexpected hiatus and “hip adjustment” as another opportunity for growth. Maybe, by some miracle, it would mean my hips would be looser and more cooperative in the saddle once I climbed back in. As for the bad boots … the bad, bad, bad dressage boots … I took them to the shoe repair guy and, as I stood there clutching my aching back, demanded he put the zippers in notwithstanding his admiration for the original workmanship. Custom-made, last-you-a-life-time dressage boots or not, they’re garbage to me without this important mechanical adjustment. I pick them up August 2. I sincerely hope I’ll be riding by then. Monday afternoon Bear had his annual visit with the dentist. His experience is a little different from ours, however. The dentist comes to him. 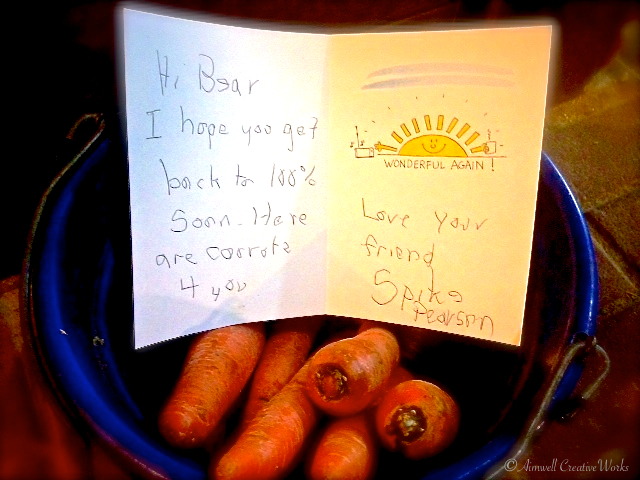 Bear gets a home visit. No waiting in a sterile dentist’s waiting room, tortured by muzak and picking through last year’s trade magazines. Nope. 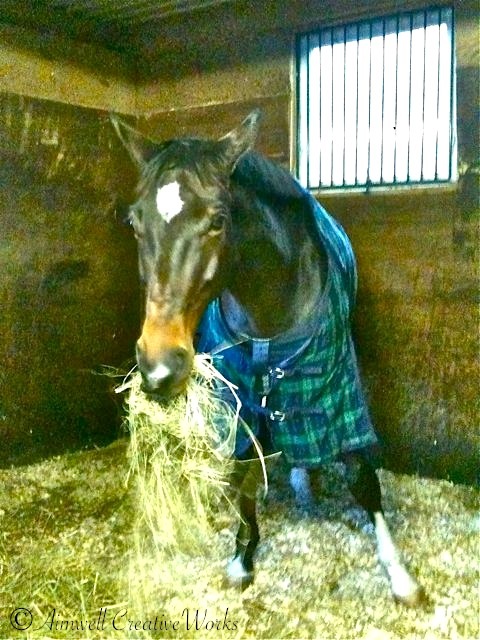 Just hanging out over a pile of hay, as usual, waiting his turn in the comfort of his own stall. That’s not to say he doesn’t experience some degree of anxiety. And down the aisle, Bear’s normally placid paddock companion, Sam, was stomping and snorting in protest, the ting of metal rasp against water-filled metal bucket more than he cared to process. And his turn isn’t until Thursday. Bear was next on the list. “Does he need to be tranquilized,” I asked innocently enough, convinced, of course, that my baby could manage without it and save me the extra cost of the tranq. This fit into my time frame so I stood back and watched the show unfold. Mac’s dental work complete, the good doc stopped by Bear’s stall to “fix him up” before heading over to dear old Teddy who, in his 30s now, is pretty long in the tooth. As you know, my boy is placid for the most part but, like most of us, he’s not big on the poking and prodding that comes with getting your teeth done. 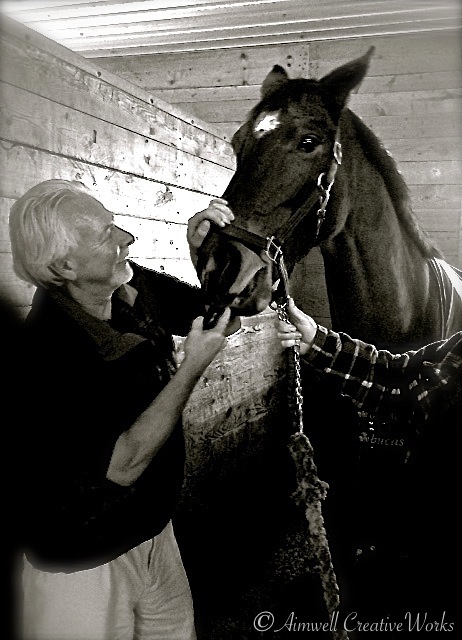 Within minutes, and with Ted sporting a relieved look on his face, the good doc was in Bear’s stall, his hand up to his wrist in my boy’s mouth feeling for sharp edges, broken teeth and other dental issues. Coach was keeping a firm hold of Bear’s halter to provide support. With a grasp of what was going on in Bear’s oral cavity, the good doc then went to town with the rasp (like a huge metal nail file), floating away the rough edges of Bear’s pearly whites. 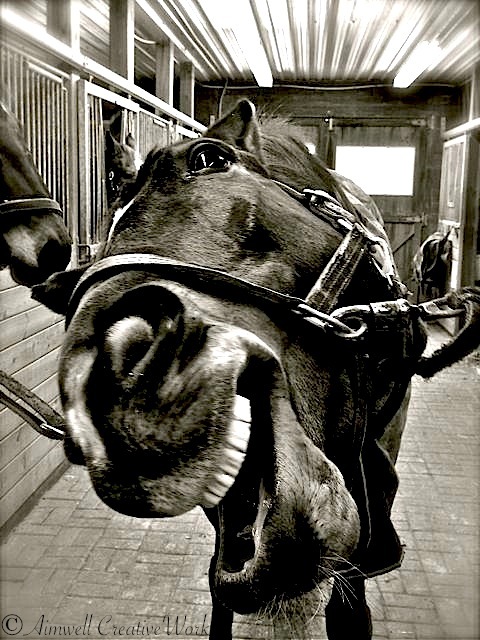 There’s not much a dopey horse can do in this situation but roll his eyes and enjoy the attention, such as it is. With Bear’s thoughts lost in the ether somewhere it look barely five minutes for the good doc to take care of business and announce a clean bill of oral health for my boy. His next appointment is set for a year from now. Bear is a handsome horse, but like all pretty boys he has a dark side. Wednesdays are a day off for Bear and I. No training, just some down time and me showing up to groom and fuss over the lad as I do every day, regardless of whether I ride him or not. Yesterday I arrived, as usual, about noon. Bear was out in his paddock with Sam, his erstwhile buddy, grazing and minding his own business when I approached the fence. Camera in hand, I hoped to capture a few images of him happily grazing with the backdrop of whatever fall colours remained in the woods yonder. The leaves have disappeared quickly this year, so there really wasn’t much to work with, but I thought at least I’d try. Sam came over and made it his business to interfere with my intentions. Jealousy, I think, is a part of his problem. 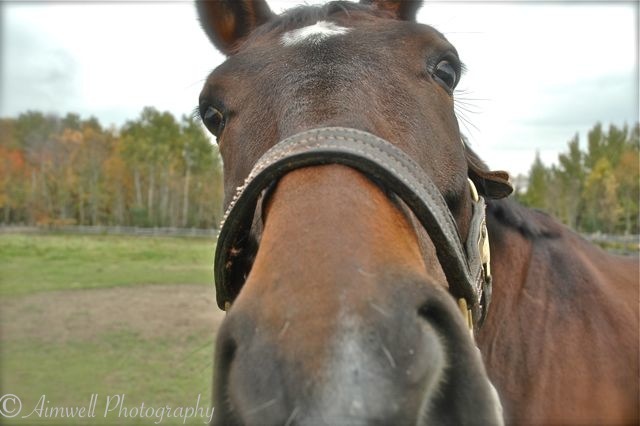 He knows I dote on his pasture mate and he wants a piece. I shooed him out of the way as Bear started to wander up from the other end of the paddock. His was a quiet, purposeful saunter in the mid-day sun to where I was standing, his hope that I would reward him with a carrot. 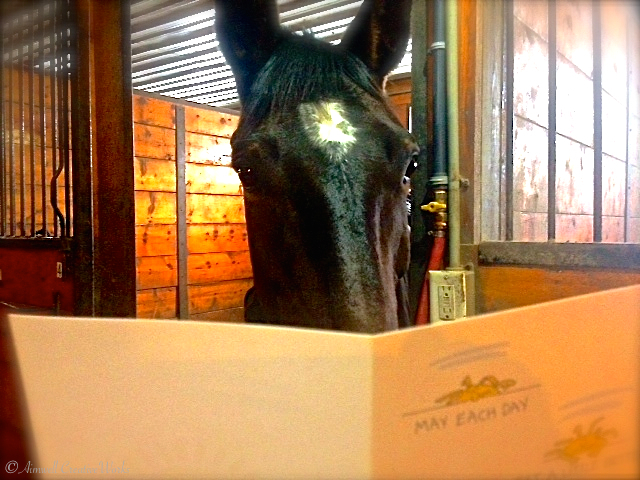 Sadly, I had not yet been in the barn and had no carrots on me. After having chased Sam away Bear met me at the fence and waited for an impatient second, nudging my arm with his nose to receive the much anticipated carrot. Annoyed, as I imagined him to be, he turned and walked purposefully away. In other words, he gave me the bum’s rush. Feeling slightly put out I watched with amazement at what unfolded next. He stopped in the middle of his coveted mud hole, dropped to his knees and rolled … and rolled … and rolled. Dumbfounded, I poised the camera and clicked away to capture the moment. This image I’ve posted before. Since his bodyguard wouldn’t get out of the way yesterday, I’ve used this image again so you get the idea of how it all ended. Needless to say I was not amused. Like some bodyguard minding his celebrity client, Sam continued to interfere with me. Bear continued to roll. I tried to shoo Sam away. He wouldn’t move. Meanwhile, Bear continued his evil frolic in the devil’s playground until he was well and truly covered in dirt. When he was done he lurched to his feet and had a good shake. Do you think I spoil him? Something a little light-hearted from the hallowed aisle of Bear’s barn abode. The boy has proven, yet again, that he belongs in the Houdini Hall of Fame. Either he is supremely, easily and utterly bored after dark … or too smart for his own good. I believe it’s a combination of both, which is interesting because ol’ rubber lips has worked out the combination of moves required to, once again, make mischief. It appears that during the still of the night when all is quiet and there isn’t a meddling human in sight, my darling all-too-clever-German-bred-boy-wonder has figured out how to open the feed door to his stall. Perhaps it’s my own fault. I have, over the years, indulged Bear’s social nature by making a habit of opening his feed door so he can stick his head out and engage with the world while I’m there. This is particularly true in winter when he spends more time indoors. From here, Bear enjoys visiting his neighbour, Robert. 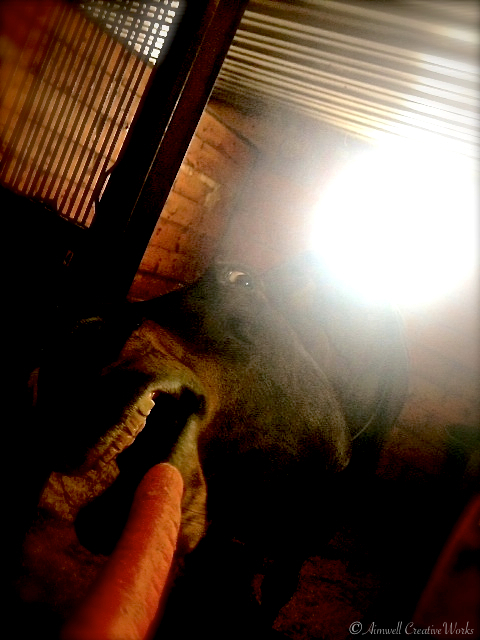 He also eagerly awaits the filling of his bucket, which hangs on a hook beneath the feed door, with his beloved carrots. I, being his doting mother, of course, am only too happy to oblige. I just want my baby to be happy. Bear has, indeed, figured out how to open this lever-less door on his own. In and of itself this not a huge problem. What has become an issue is the fact that my closet mechanical engineer has also figured out how to unlatch Robert’s door and push it wide open … all from his perch at the feed door. So, not only is Bear adept at creating his own escape opportunities (see The Party Animal) he is all too willing, and able, to create these opportunities for others. Fortunately, Robert is too old to be bothered with making a run for it and has, in fact, been discovered in the morning standing at the back of his stall, perhaps a little confused as to why his stall door is open at all. How to curb Shakespeare’s quick wit? Management has put a chain in place so Bear, while he’s still able to dislodge the mechanism, can no longer push open the door and lean over to mess with Robert’s latch. Slightly off the beaten track today, but I felt I just had to share this little moment of unguarded candor from Saturday. Holy horsefeathers! … With so many lip-plumping, shine-enhancing shades and varieties and brands on the market these days what was once a simple foray into creative cosmetic self-expression has become more of an exercise in close-your-eyes-and-pick-one. Another consideration: Do I trust the salesperson (usually a woman) to have my best interests at heart when debating the merits of pink versus peach against my skin? Sometimes I wonder. Call me a skeptic, but when she says I look good in a particular shade does she mean it or is she simply trying to make a sale? Perhaps this is more about my own trust issues, I don’t know, but I’ve bought a lot of lipsticks over the years that, under artificial store lighting, looked really good but, when I got home and tried them in natural light, made me look like a charicature of myself. My make-up case is a veritable lipstick grave yard. During my little escapade I became acutely aware of a roving make-up artist brought in by the store for the day. Her mission: to provide make-up refreshers or, if a hapless “victim” purchased $75 worth of product or more, a full makeover. She wasn’t really harassing people, but you know how it is … when you’re in a hurry you don’t really want to be bothered interacting with someone whose real purpose is to sell you stuff you don’t need. Frankly, I already own a full complement of expensive product I haven’t been able to use recently due to my ongoing entanglement with adrenal fatigue. I haven’t been able to get out much. The barn has been my social focal point and, as you might imagine, there isn’t a great call for a full face of make-up there. So, doing my best to make myself invisible, I crouched low to the ground and ruminated with much focused intensity upon which of the the many gloss colours at my disposal might be most lip-smacking appropriate. I don’t wear a lot of make-up, but I am particular when I do. Then, as the wolf is to the rabbit, I was pounced upon. “Can I help you find something?” the over-made-up make-up artist enquired with a saccharin snarl. How to wriggle myself free? “No thanks!” I responded quickly and resumed my focus on a seemingly fruitless search. The prowler wouldn’t take the hint and continued to hover, almost standing on top of me. So while still crouched, I turned on my heels and decided to get a closer look at her. She was young middle-aged, I’d say, and face painted in such a way, no doubt, as to demonstrate her prowess in the cosmetic arts. Heavy foundation, piled-on layers of eye shadow in shades of cerise and black, false eye lashes, big ruby lips, and hair dyed black sporting a streak of cerise that flashed carelessly through long unkempt bangs — a little too Goth, for my taste. Still, I smiled, thanked her for her query and returned again to the task at hand, hoping she’d go away. I was to be disappointed. “We have a special offer on today … ” she began her cheerfully whining speech. I only half listened as she went on about this and that to do with the special in-store offer. Victory complete, I exhaled with relief and returned again to my torturous lipstick hunt. It was the wonderfully dumbfounded hesitation in her response that amused me. Perhaps she’s never spent time with a horse. Perhaps the notion of going out in public without a full face of make-up is anathema to her. Or, perhaps, both notions are as foreign to her as wearing a full face of make-up every day is to me. Had I intrigued her or confused her? Or did she think my manner downright rude and boorish? I don’t know and it doesn’t matter. What I do know, from personal experience, is the trap that’s set as soon as you park your derriere in the make-up chair of a cosmetic department. You come in for a lipstick and, unless you are really, really strong, leave with a full compliment of new face paint you will literally never use — all because the make-up magician made it look so good. Once home you’ve either forgotten, or have no idea, how the tricks work. Experience has taught me that being cornered in this way is to be avoided at all costs. 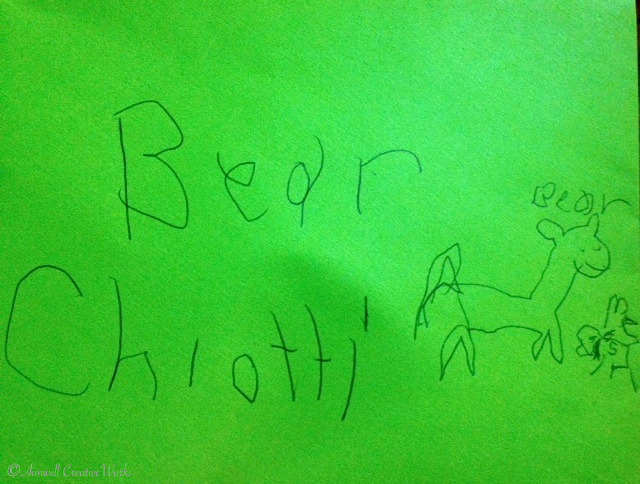 Like my horse, Bear, I don’t appreciate being bullied into doing something I don’t want to do. And sometimes, like Bear, I need to get myself out of that corner by demonstrating a little bit of attitude. So, apparently, Bear is a party animal. When Christine entered the small barn early one morning last week to feed the hungry hordes their morning hay ration, she was greeted, quite unexpectedly, by the blanketed derriere of an escapee … my Bear. “How did you get out?” she asked astonished. Now, it’s not unusual for the bored and resourceful horse to pop his head over the half-door and fidget with the fastened latch. Their lips, practiced at maneuvering edibles, are strong and flexible and easily grab hold of all kinds of [forbidden] objects. 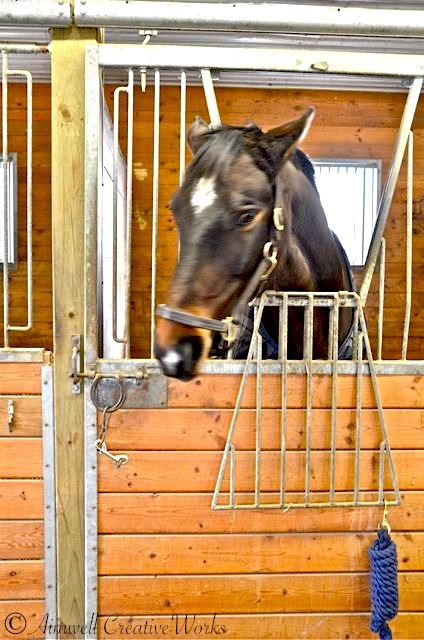 Several of the 10 horses living in Bear’s cozy barn have proven adept at unfastening their stall doors and so are now on lock-down at night. My “butter-wouldn’t-melt-in-his-mouth” Bear happens to be one of them. This is because a few years ago he made his first, and supposedly last, great escape. He was discovered, one morning, chowing down on the contents of a 50 lb sack of carrots, evidence of his one-horse aisle party littered all about him. You could tell where he’d been and which of the other horses he’d visited by the trail of hay and manure left in his wake. 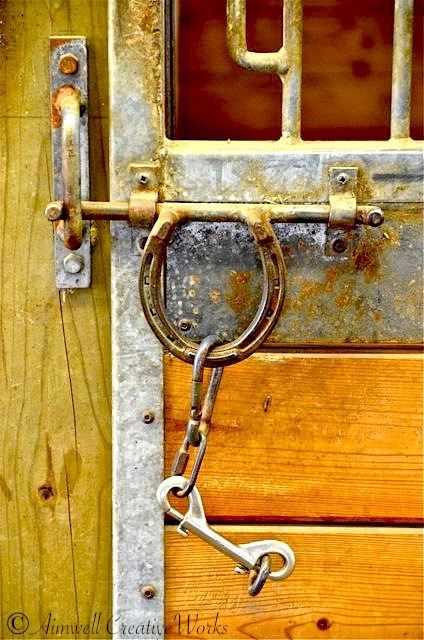 Thus, to curb his lust for channeling Houdini, a stall security system was devised that could not, under any circumstances, be manipulated by wandering equine lips. 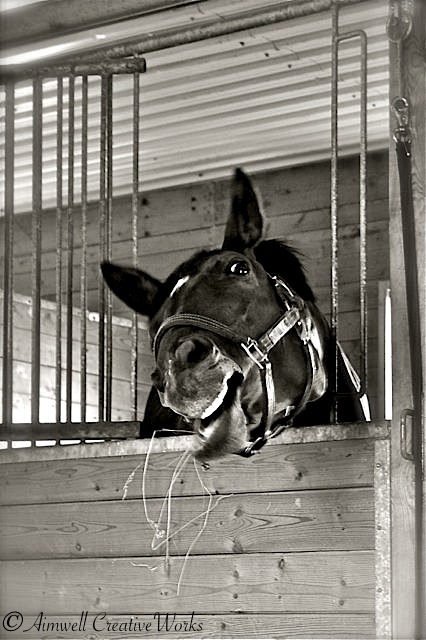 So, it was, indeed, a great surprise to find, once again, that he’d been making the rounds as the quintessential party animal — feasting upon the morning’s stored ration of hay, fertilizing the poured concrete floor and fraternizing with his barn buddies. He was enjoying a conversation with his old pal, Doc, when Christine intervened. But how the heck had he escaped in the first place? Later that day a small herd of barn mom’s congregated around Bear’s stall door and studied the latch for several minutes. One enterprising horse mom, Bears “gammy,” took a step stool into his stall, climbed upon it and, when we had closed the door behind her, proceeded to pretend to be Bear by leaning over the door and a) reaching for the latch to fiddle with the lock with her fingers as a horse might with his lips, and b) rattling the door by leaning her body against it repeatedly and thus some how releasing the mechanism. We deduced, after a good laugh, that it would have been impossible for him to tamper with the latch. No amount of door rattling or lip gymnastics would have given him an out. The only conclusion we could reach was that the door must not have been properly latched in the first place. Bear, being the rich opportunist that he is, would have noticed this when leaning on the door some time during the night and taken full advantage of the situation by pushing it all the way open to let himself out. Still, no harm done, except that Bear was rather dopey that day, standing in the paddock catching up on zzzz’s instead of voraciously eating, which is his usual habit. Something, I think it can safely be said, that is true of party animals the world over. As Mother Nature releases her latest Fall collection (the same every year, but who’s complaining), my horse dons a retro look all his own … a big, fuzzy, seasonably fashionable, Fall coat. Bear is, for better or worse, amongst the most ardent followers of Fall’s irreverently fluffy look. Unlike his sleeker chic summer style, Bear’s cool-season wear is more provincial — thick, fuzzy, like … well … a bear! I run my hand through his hirsute coat rather than over it, my fingers buried in plush. He is suiting up for Winter. 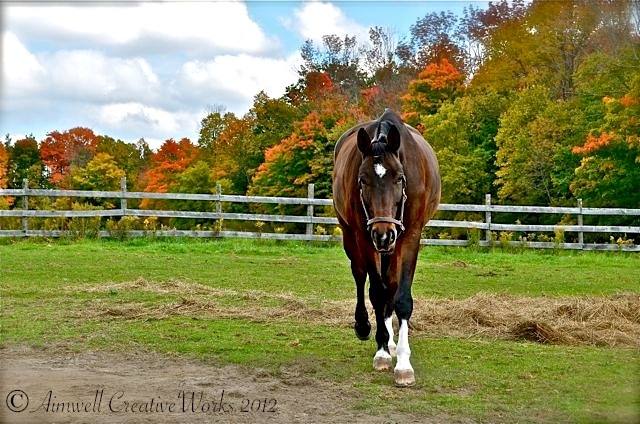 The Fall season’s colour trend for this horse-about-country is a rich, dark bay … a mahogany melange of reds and browns and blacks — my favourite range in the equine colour palette. Naturally three white socks, white-starred forehead and the white snip on his muzzle distinguish him from others sporting the same outfit. Everyone needs their own personal statement. A thicker, more luxurious coat of necessity requires a more intense grooming regimen. Designed to insulate and provide a certain amount of water-resistance the Fall coat is, indeed, prone to attracting all manner of dirt or, heaven forbid, mud when Bear is engaged in one of his more pleasurable outdoor pastimes — rolling in the dirt patch (bottom left of first image) in Poet’s Paddock. In fact, no amount of elbow grease can release completely the layers of, dare I say, filth, which gather beneath the surface yet is plainly clear to the eye. A never ending cycle of currying and brushing and currying and brushing isn’t enough to remove all the detritus that lurks there. Thus, in spite of my best efforts, there is always, hovering at the surface of his fluffy new Fall coat, a layer of dirt that makes it look as if I’ve put no effort into grooming him at all. 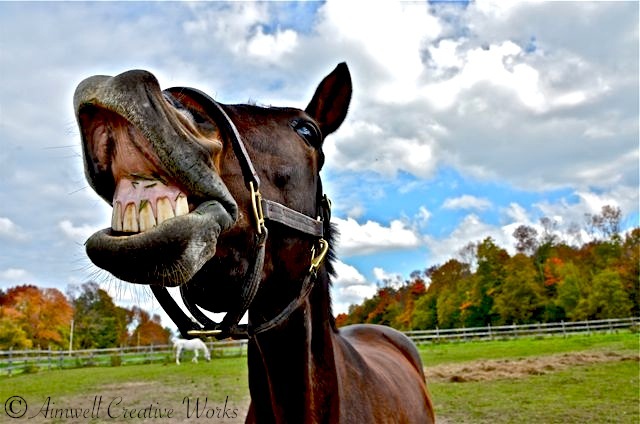 I don’t know, perhaps it’s part of the equine Fall “look,” and I just don’t get it. There are many things about fashion in general I just don’t understand. And then imagine, if you will, Bear’s appearance after his workouts, his fuzzy coat randomly caked in sweat. 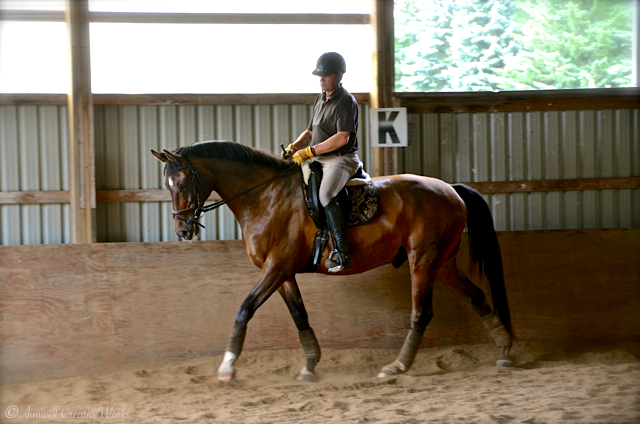 Remove his saddle pad and voila! … as profound a case of a bad hair day as you’re ever likely to see — all sticky and matted and gross. Fall’s fashion statement leaves something to be desired — it simply is not functional as active wear! You see, before I can brush him out he must dry off. On cold days this requires the use of a “cooler” — a light fleece or wool blanket that wicks off moisture so he doesn’t catch a chill. With his coat as generous as it is now, this can take a long time. And while he, as the indulged might, enjoys the extra preening I do need to consider my other responsibilities. Not every day can be a spa day. So, how to manage this Fall fashion faux pas? 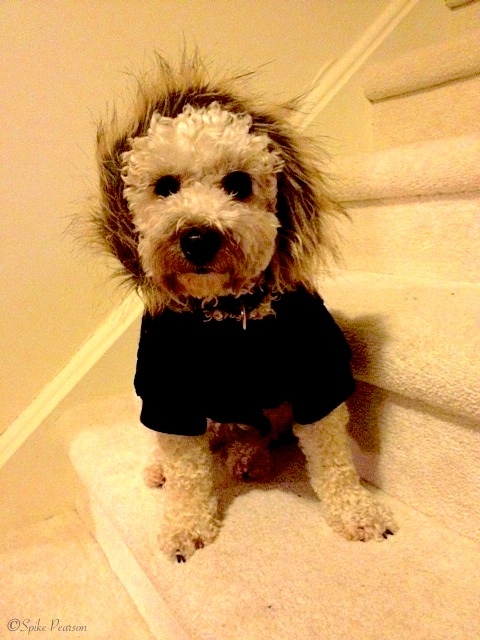 In about a month (maybe sooner because he is really fuzzy) Bear will sport more urban chic Winter finery. His fluffy look will be clipped away completely so that all of which I’ve shared here is nothing but a passing unpleasant Fall non-fancy. No more unpleasant, lingering sweatiness for him. No more dirt up my nose. No more floating surface dust cloud that renders him looking ill-used. Just a lovely ready-to-wear, high-season, shiny coat of seal grey/brown (also rather beautiful) — easy to clean and accented and protected by myriad high-quality warm blankies and accessories provided, at some cost, by yours truly. 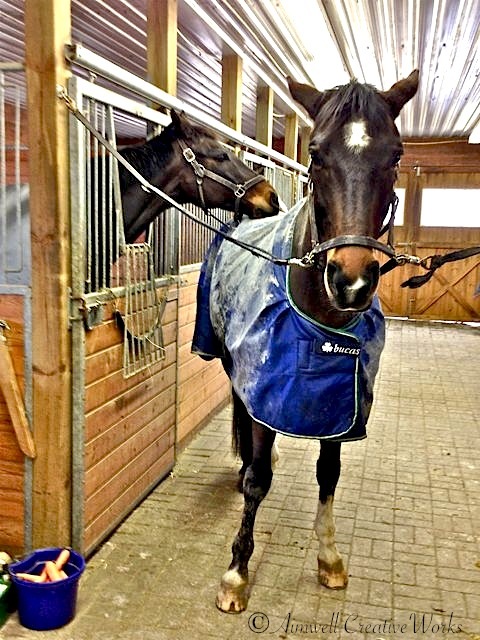 He’ll model a carefully selected assortment of outerwear designed for equine comfort indoors and out. 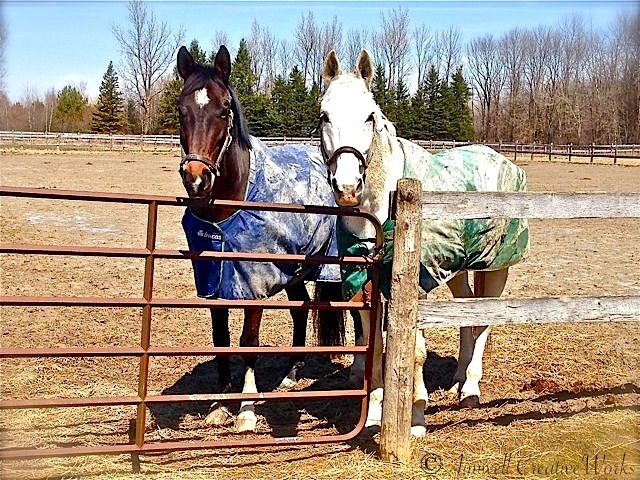 A stylish waterproof, wind-resistant rain sheet (unfortunately not horse play-proof but you can’t have everything); blue and green plaid day sheets to wear in the barn (pictured below); grey/blue/black plaid cozy “jammies” with a burgundy fleece lining for when the nights are colder; a green turnout shell for those days outside when it’s reasonably mild, and a heavier blue/black/cream checked outdoor blanket for those really cold days (to be worn over his day sheets for extra warmth). His undergarment a blanket buddy of pulverised parachute silk (I least I think that’s the fabric) to protect his broad shoulders from blanket rubs. Bear will be toasty warm and clean. He can roll all he likes in the mud and the blankets will take the brunt of it. No more bad hair days for him. No more dust and dirt storming off his coat and clogging facial orifices for me. His Fall/Winter wardrobe will be both functional and fashionable — no doubt what every mom wants for her child, even when it is the four-legged (fuzzy) kind. 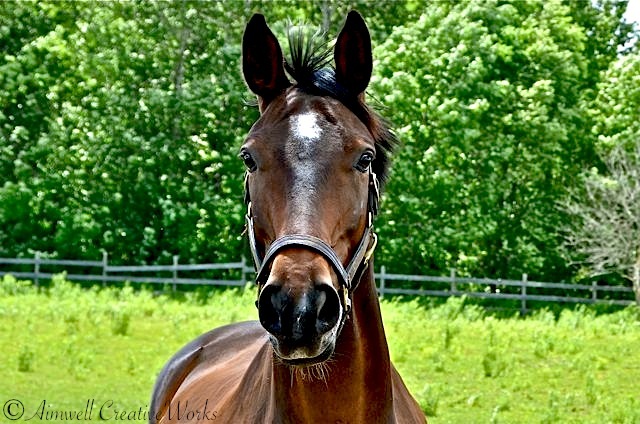 Before I can have an effective connection with my horse I need to understand what makes him tick. 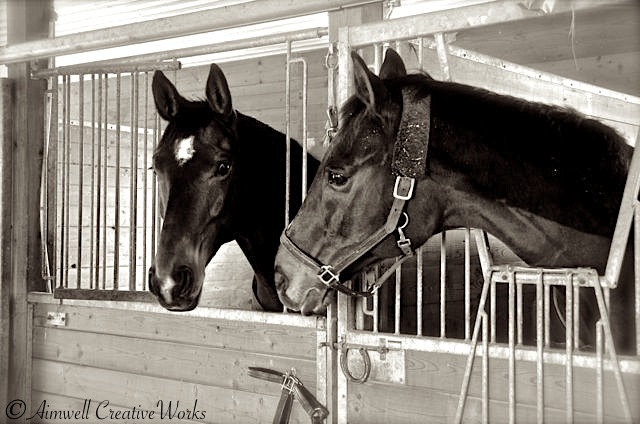 Similarly, it’s my desire to have a better understanding of your experience with horses so I can create an effective connection with you through this blog. So please, take a teeny, weeny moment to click on the statement below that best reflects your experience with horses. Leave comments if you wish. In ensuing posts I will muse upon and write about each of the statements, share stories, etc. 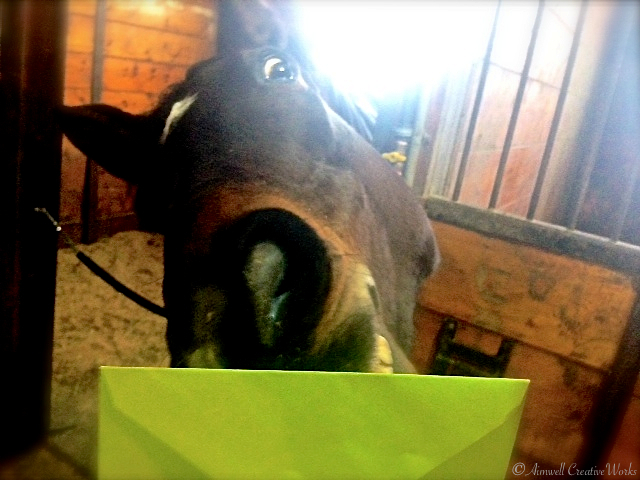 to demonstrate that you are not alone, whatever your experience with, or interest in, horses may be. Obviously you have some interest, or you wouldn’t be here, right?